Golf Master starts off traditionally enough, with a title menu consisting of a fair number of options. The menu allows you to choose the number of players from one to four, the difficulty level of the game from three possible choices (novice, amateur and professional), the game mode from two possible ones (training and competition) and a selection of holes you will be playing. The last item is really an interesting one, because you can choose to play the whole set, either half of the 18 holes, or any of the holes as a single round, but it should be noted that choosing a random hole as a single round can only be done in training mode. The full and half sets are available for competition mode. As usual, the level of difficulty only affects the wind's effect on your gameplay: novice mode has no wind, amateur mode has some wind, and in professional mode, the wind can even change during the flight of the ball, and the wind's effect on the ball is stronger than in amateur mode. Also, the way the ball is shot from different surfaces is affected by the difficulty level. Once you have made your choices and decide to start the game, you are taken to a signing-in screen, which is very similar to those in Hyper Sports and Rambo. The difference here is, that you can use Scandinavian letters (apart from the Swedish Å) in your name, and the maximum amount of characters you can input is eight. These two buttons select your club from 14 different ones, which include a Driver and three other wood clubs, a Wedge and 8 other iron clubs, and a Putter. In case you don't know the use of these different clubs, basically the flight of the ball is longer and lower towards the lowest number wood club (Driver), and becomes shorter and higher towards the Wedge, which is practically the highest number iron club. Naturally, the Putter is used for putting on the green. You can't (or at least shouldn't) use a Putter on rough terrain or a bunker. These two buttons adjust the flashing crosshair displayed in the edging of the little box at the left end of the info panel. This determines the direction you're going to shoot the golf ball into, as directly related to the map. In other words, if the crosshair is pointing to the right, the ball is shot to the right side of the screen. These two buttons adjust the power of your shot, by moving the flashing meter immediately to the left of these two buttons. This button makes the shot. Good luck. The lower rightmost button lets you choose the hole, but it only works in practice mode. As you push the button, the game goes straight into the next hole, so it works practically the same way the hole selector option works in the main menu. If you decide to quit the game before you have completed the chosen hole or the course, you can do so by pushing the RESTORE key. The SPACE BAR is really the only useful key regarding gameplay, as it makes the map scroll its length, so you can see where you're supposed to go, if the hole happens to be longer than a single screen's width. Also, while not exactly useful regarding gameplay, the RUN/STOP key is assigned to toggle music. 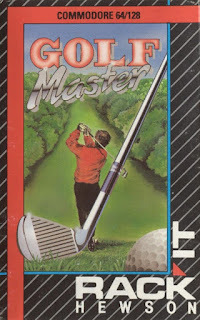 Golf Master's graphics are clear, if a bit underwhelming. Since every golf game since Leaderboard is compared to it, the one thing I can say in Golf Master's defence is that it doesn't have to draw each screen separately as you make progress. It's the same advantage as in all the various miniature golf games. At least Golf Master has some animation and even a bit of humour, which is displayed in the small screen which opens up, replacing the buttons panel as you make the shot. The small screen also shows any other information you might want to know, such as if the ball hits a bunker or goes missing in a water hazard. But getting back to the action screen, all the nature bits in the action screen look enough of their part, and the differences between rougher and smoother terrains, and all the hazard bits are clearly defined, so it's all good in that sense. Various holes and animation frames. The unfortunate side effect of this style and point of view on the action screen is that it all becomes a bit boring already once you have completed the first hole. A third-person behind view has the advantage of making the area you travel look a bit different each time you change the location, even if the area looks as bland as it does in the original Leaderboard. Of course, golf is a game of calculations, patience and accuracy, so the element of graphics shouldn't be too much of a concern when playing any digital golf game. However, one has to admit that even a golf game is nicer to play with lively, high quality graphics. In addition to the increasingly familiar in-game graphics and everything else above, you get to see a scoreboard between each hole in competition mode, as well as a separate Final Results screen once the selected course has been finished. The scoreboard doesn't look like much, although it's much more computerish than you would expect, but at least the Final Results screen has some colourful floating balls scrolling above and below the results. Sound-wise, Golf Master is not a very traditional golf game, because it offers two rather nicely done, chirpy tunes: a rag-timey blues tune and a more straight rock'n'roll sort of a thing. The two tunes play separately, but are repeated infinitely. However, as I mentioned earlier, you can toggle the music on and off during play, which reveals the game's scarce sound effects - two different sound effects for hitting the ball (regular swing and putting) and one for splashing into a water hazard. They sound similar enough to those in the Leaderboard games, so I can't complain. And really, Golf Master has something that Leaderboard doesn't: two proper tunes. So technically, Golf Master is superior to the Leaderboard games in sound department, but whether you like to have any music or not in a serious golf game is entirely your own problem. At least you have the choice here. 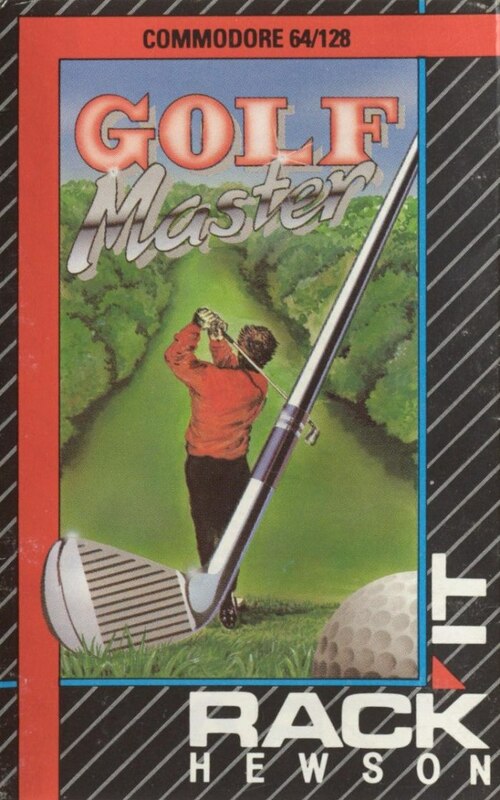 All in all, Golf Master is certainly worth having a go, particularly for a budget title as it was released originally as. And indeed, it definitely has a budget sort of a feel to it, but a high quality one at that, so it sits well in Hewson's budget catalogue, along with games like Anarchy, Battle Valley, Tunnel Vision and Zamzara - the latter of which I should be getting into a bit later on this year. There you go, another Finnish C64 title given the FRGCB treatment. Hope that got you inspired to try the game out - it certainly was a positive surprise for me when first tried it. Next month, I shall be focusing on a single big game company, so I shall be forgoing the Finnish Retro Game Review series for the duration, but rest assured, the series will continue in April. Thanks for reading, see you soon!